The summer is about upon us and festival season is breaking out already. This year the Cascade Blues Association is planning on being a part of many different events to bring our brand back out to the public. Of course plan on seeing us with booths at events like the Cider Summit and Waterfront Blues Festival, but we’re also looking at various street fairs and other festivals, too. To do this we need our members to help volunteer. 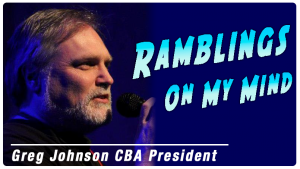 Shelley Garrett will be at the upcoming membership meetings to sign-up volunteers for the CBA booth at the Waterfront Blues Festival. Let her or anyone on the Board of Directors know if you’d like to be involved with other events, like the CBA Concert in the Park in August. We can always use your assistance. Please don’t miss out on the Journey to Memphis competition this month. We have 15 acts going head to head for a chance to represent us at the International Blues Challenge next January. We’re excited to be holding the event at Mekong Bistro on May 19 and 20. Lots of new faces this year in the competition too, proving that the blues are still strong and alive in our city — as if we didn’t already know that. Remember there are multiple ways that you can help out the CBA every day. If you shop at Fred Meyers, sign up for the Community Rewards program. It’s free and when you earn your own rewards points with purchases at the store, it will match those points for the CBA and we receive a donation check regularly from the company. Check with your employer, too. Many have matching donations for your gifts to charitable organizations, including the CBA. We want to thank those who have also made a point to single out the CBA. We’ve had a couple of generous gifts from the wills of members who have passed, and Dean Mueller and Julie Amici recently received a grant from the Oregon Community Foundation that they kindly shared with the CBA. Thank you so much! Look for other exciting news from the CBA. We’re currently investigating new merchandise outlets to better serve and offer more to our members. And we’re thinking about new events that again will put us more out front and bring our brand in focus to the community. And as always, support our musicians and local venues. You are the strength behind their success by attending their shows and clubs. Nobody wants an empty room. Tip the bands and buy their music, if not at the show then support our local businesses like Music Millennium. See you all in the clubs and at the festivals.